There are so many lessons to learn in a garden! Some easier than others, but all mirror the struggles and thrills we experience in life. I remember the ﬁrst ﬂowers I grew were from seed— marigolds—and they were magniﬁcent. I was so proud of that one little planter on my deck! A few years later, I had a house with a yard and a toddler. I tried planting with my helper, but he showed no interest until a kindergarten experiment growing a sunﬂower from seed. We started that ﬂower as a seed in a plastic cup with a pencil as a stake so it grew straight. He learned the delight of “I did that!” When it flowered, we picked some seeds for ourselves and left some for the birds—he loved sharing with the birds. 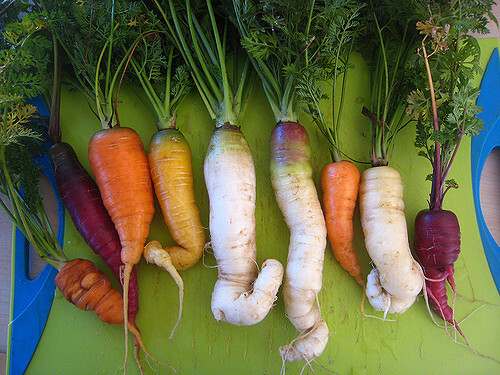 That summer we also grew carrots—all he wanted was to pull them up to see how big they had gotten! We ate tiny twisted carrots and he appreciated how they ended up on his plate. I had his attention and he got to see some magic. Enjoy work. Kids don’t need prompting to ﬁnd the joy in using a hose or digging in dirt but helping to carry a watering can is hard work, so is ﬁlling up containers with dirt. Show them weeds and the satisfaction of yanking them out of the ground! Experience success. Along the path from seed to table are little milestones, such as the cotyledon (the first seed leaves) peeking through the dirt and unfurling its leaves, the seedling growing strong, and producing fruit that we can eat right oﬀ the vine. They did it! That hard work led to success—there’s a beneﬁt to work. Appreciate fresh food. Nothing tastes as good as home-grown veggies! If you give the children in your life a garden to grow, they will beneﬁt in so many ways. Commend them when they share a bounty of fresh greens. Share in their disappointments when things don’t go well. Teach them about life while they learn to be gardeners. Later on, when they’re teenagers helping you in the garden will be a real miracle! Article by Michelle Assoian, Buncombe County Extension Master GardenerSM Volunteer. While in hand-to-hand combat with the weeds in my asparagus bed, my young neighbor with her active, inquisitive 3-year-old son and 18-month-old daughter stopped to watch me work. The weary mom sighed, lamenting that she wanted her children to enjoy gardening . . . someday . . . but that would have to wait until they were older. Little kids, in the garden? I knew where she was coming from. Her comment triggered the memory of my 2-year-old grandson “helping” me pick tomatoes—proudly presenting his tomato—still attached to the tomato plant—roots and all! For toddlers, mimicking gardening acts—planting, watering, weeding, checking for bugs, picking flowers or vegetables—is a main source of enjoyment. 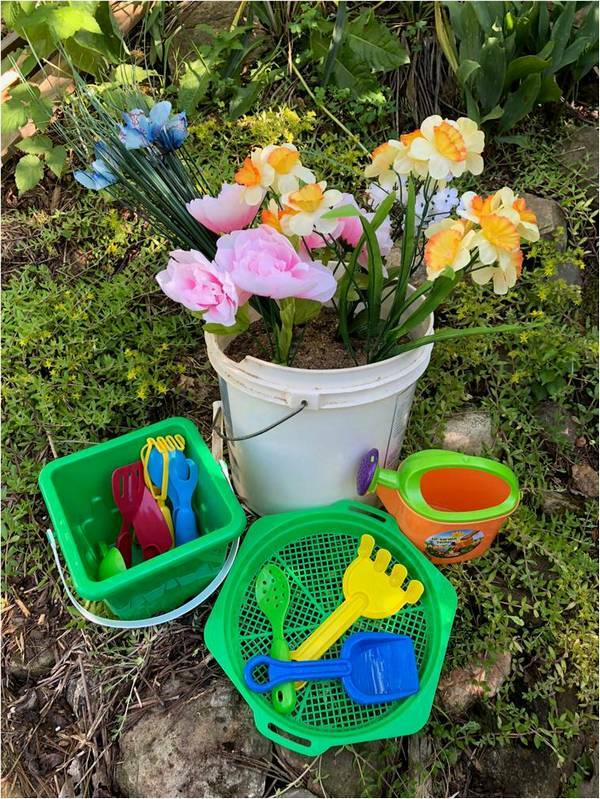 Because toddlers delight in repeated play activities, a sand garden—a sand-filled container complete with an array of plastic flowers and garden tools—can provide hours of gardening fun. By the time a child is 3 or 4, a large pot can become a container garden, putting the garden literally at a child’s-eye level. A single plant is a good beginning, but try pairing a vegetable plant with a pollinator plant in a pot clearly marked with the child’s name. This gives the child a specific place to practice the planting, watering, weeding, bug-checking, and harvesting with adult guidance. 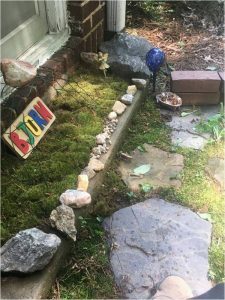 Taking pictures of the garden as it develops and making a simple My Garden Book helps the child develop a sense of accomplishment. 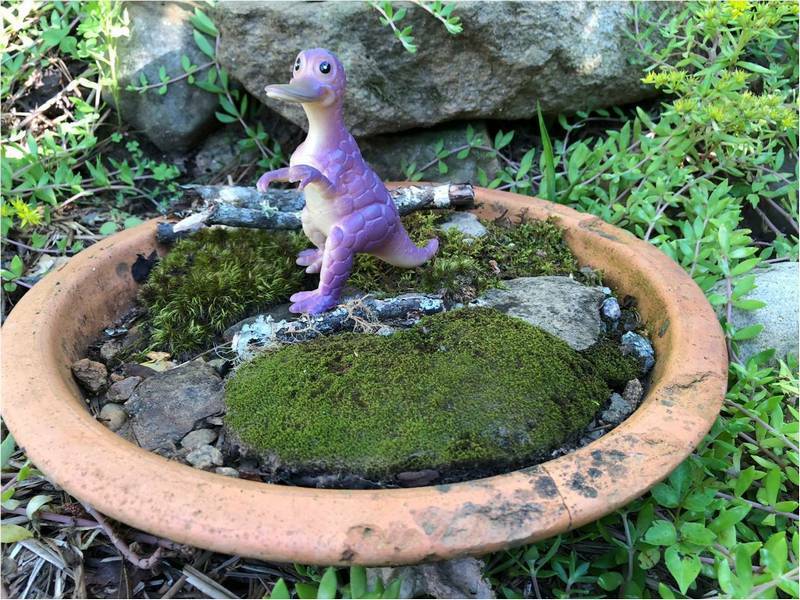 Saucer gardens are another way of incorporating child’s play into gardening activities. The gardens can be as elaborate as moss gardens for a fairy village, or special terrains for woodland creatures incorporating sticks, rocks, red clay, small plants, or trees. Add plastic dinosaurs, animals, or superheroes to provide the action. Saucer gardens can be as simple as lettuce gardens to provide salad greens. By the time a child is 4 or 5, a designated spot in the family garden, or a place in the yard, can be turned into a kid’s raised bed garden. Keep the space small—4- by 4-feet maximum. Have it in a safe place within parental view. Establish a routine for maintenance. Provide a laminated card with a simple pictorial checklist to help the child focus on what needs to be done each day. An inexpensive magnifying glass is a great help in identifying bugs, worms, and changes in the plants. And, don’t overlook children’s ability to locate a found garden spot themselves, like these unused concrete steps turned into a moss garden. Click here to download a list of gardening books for children 5 and under (PDF format). Did you celebrate National Agriculture Day? 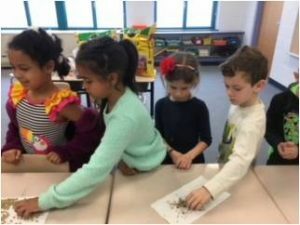 Each year agents and volunteers in Cooperative Extension offices across the nation visit schools to read and lead a class in a simple agriculture-related activity to recognize this event. National Agriculture Day activity at Hominy Valley Elementary School teaches children about plant seeds. The Agricultural Council of America, “composed of leaders in the agriculture, food and fiber communities dedicated to increasing the public awareness of agriculture’s vital role in our society,” [https://www.agday.org/] sponsors this national activity which began in 1973. 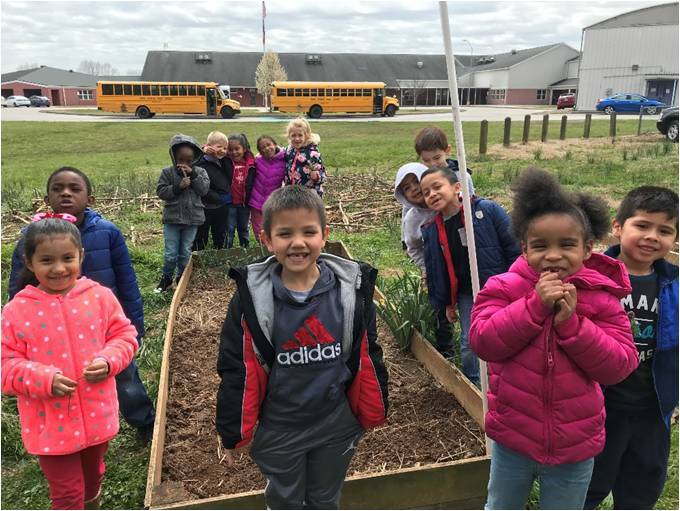 On March 20th, several Buncombe County Extension Master GardenerSM volunteers (EMGV) visited interested Buncombe County elementary schools to celebrate National Agriculture Day. The visits taught students about the importance of agriculture in Buncombe County. 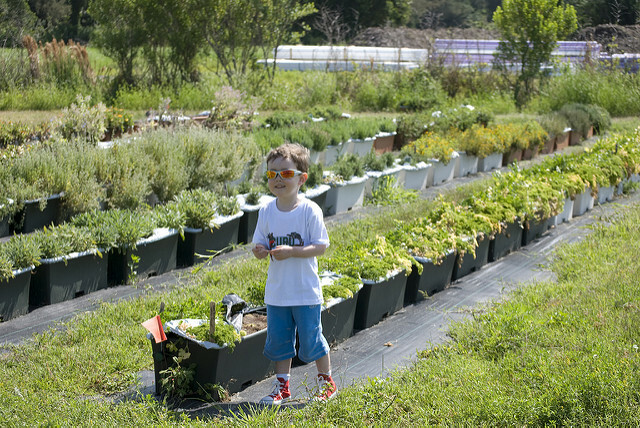 The students—even kindergartners—talked about the crops grown here on their family farms. Along with reading a book and sharing our enthusiasm, we led the students in a hands-on seed activity. The boys and girls made seed necklaces to learn that seeds need water, air, and warmth to germinate and grow. They put radish seeds into tiny, clear-plastic zip bags attached to a yarn string, added a spritz of water to a cotton ball, and puffed up the bags to provide the seeds with air. The students were to wear the necklaces to provide warmth until the seeds germinated. The EMGVs and the students all enjoyed celebrating agriculture! Thanks to Holly Jordan, Buncombe County Extension Agent, 4-H Youth Development, for giving us this opportunity. Children at Emma Elementary School learn about vegetable gardening on National Agriculture Day. Buncombe County EMGVs reach out to youth from tots to teens throughout the year. 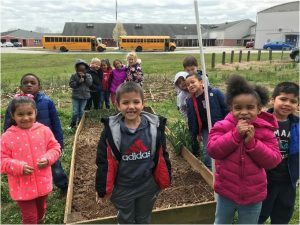 Volunteers lead after-school garden-related activities, provide garden-related lessons in classrooms, assist student garden clubs, and other events. Schools can apply for a Buncombe County EMGV School Garden Grant in February of each year. To see what the children have to say about their school gardens, read our recent blog post, School Gardens, School Kids. During the summer, EMGVs assist with 4-H mini-gardens, teach gardening at day camps and community recreation programs, and respond to other community needs. Each year, we encourage youth to enter their gardening successes in the Youth Flower and Garden Exhibit at the Mountain State Fair. The deadline for registration is August 24, 2018, but you can plan and plant your entry NOW! For more information, go to http://www.wncagcenter.org/p/mountainstatefair/competitions/335. Next year, you, too, can celebrate National Agriculture Day. But why wait? Every day is a good day to celebrate agriculture! Article written by Carol Brown, Extension Master GardenerSM Volunteer.